When Gary LeBlanc volunteered to help in the relief efforts during the aftermath of Hurricane Katrina, he was shocked at the food that was served to those in need. He knew there had to be a better solution. 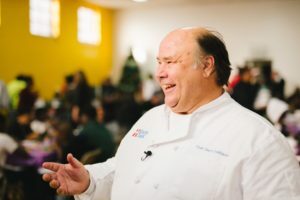 LeBlanc took his thirty-five years of experience in the hospitality industry and created Mercy Chefs, a faith-based, nonprofit organization with the purpose of meeting this need. Mercy Chefs was built and it works, time and time again. Food does so much more than nourish the body, it’s a path to comfort, and an avenue for healing. 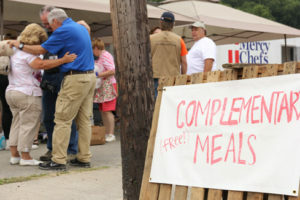 During its ten years, the organization has prepared 1,100,000 meals, which averages to 301 meals per day. 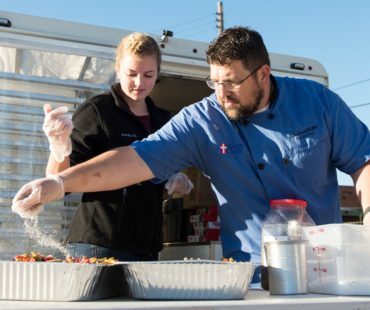 When a situation presents itself, the volunteers at Mercy Chefs coordinate with local churches and Christian-based organizations to meet the needs of those involved. Their three mobile kitchens and two refrigerated trailers are dispatched and meal preparation begins. The mobile kitchens are self-sufficient and able to run at full speed without electrical hook ups, making it possible to reach people in the most desperate conditions. On average, Mercy Chefs has served 100,000 meals each year. In 2016, however, the number soared to new heights. By the end of November, not counting the Christmas meals prepared in December, the organization will have served upwards of 250,000 meals this year. In the last eleven months, they’ve traveled to a staggering twelve different locations. Besides their disaster relief program, Mercy Chefs has developed other programs to feed and nourish those in need. The Urban Outreach program provides nutritious meals in low-income communities and homeless populations. The Permanent Kitchen program establishes custom-built kitchens in communities that need long-term or ongoing assistance. They train local volunteers on how to prepare the meals and maintain the kitchen and equipment. Once the basics are in place and running smoothly, Mercy Chefs donates the fully equipped kitchens to the community. Another program dear to the hearts of those at Mercy Chefs is the Clean Water program. An international program, Mercy Chefs provides water purification systems to communities in places such as Haiti, Nepal, and the Philippines where clean drinking water is limited or nonexistent. These purification systems provide clean water to entire villages. They also distribute purification straws, which can provide water purification for an individual for up to six months. As a nonprofit organization, Mercy Chefs is funded by private donations and sponsorships. Over the last ten years, 4,200 volunteers have volunteered to help, 80 percent of which are non-chefs. From donor dollars to preparing plates, there are numerous ways to get involved. If you’re interested in learning more about becoming a volunteer, visit their website at MercyChefs.com. Corporate sponsorship is the other major fundraising tool for Mercy Chefs. Corporations can help in several different ways. Many have donated equipment or products. Others have established volunteer incentives for their employees. Some have even made matching gift promotions. But the bottom line always comes down to, well, the bottom line…cash. Cash donations keep Mercy Chefs doing what they do best, feeding the minds and souls of those in need during an emergency or disaster. The average meal costs $2.50. Doesn’t seem like much, but considering the million plus meals they have provided thus far, it adds up quick. The monthly grocery bill is almost $23,000. All donations are 100% tax deductible. Founder, Gary LeBlanc, says it best, “Please take the opportunity, as I did all those years ago; volunteer or partner with us and see what God can do”. 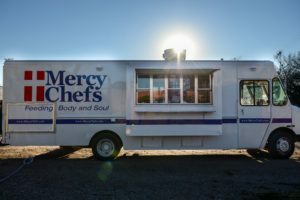 For more on the Mercy Chefs organization, visit their website at www.mercychefs.com.